The Wileyfox Spark is the company's cheapest device to date and one of the lowest cost new phones on the market. Find out whether this Cyanogen phone is a budget blinder or a bottom-of-the-barrel beggar in our full review. The Wileyfox Spark costs £89.99 (about $118) and comes with free shipping direct from Wileyfox. It is available in white and black. For just a few dollars more, the Moto G (2015) serves as an alternative choice. It is a good alternative, too: it's faster, has more battery life and a surprisingly good camera. For an additional £9.99 ($13) you can get a three-year warranty, and a further £9.99 per year ensure you’re covered for display replacements. The Wileyfox Swift feels humble and looks unremarkable. On its rear it has a rough, removable plastic cover. On the front, we have round-edged Dragontrail glass, which comes from the factory covered in a protective film. The 5-inch model has very similar dimensions to the Galaxy S7, but is not waterproof or dust-repellent. The 5-inch display with its 1,280 x 720 pixels gives the Wileyfox Spark a respectable 294 ppi. It is not exceptional, neither in terms of brightness nor color settings; however, the performance is reasonable for the price. The touch screen works well, unlike some other low- or even mid-range devices, saving frustration when you operate the on-screen keyboard. The Wileyfox Spark is dual sim, enabling you to use two micro-SIM cards simultaneously. In addition, you can use and format a microSD card as internal memory. This is a quick solution to the threat of quickly filling up the lowly 8 GB of internal storage. 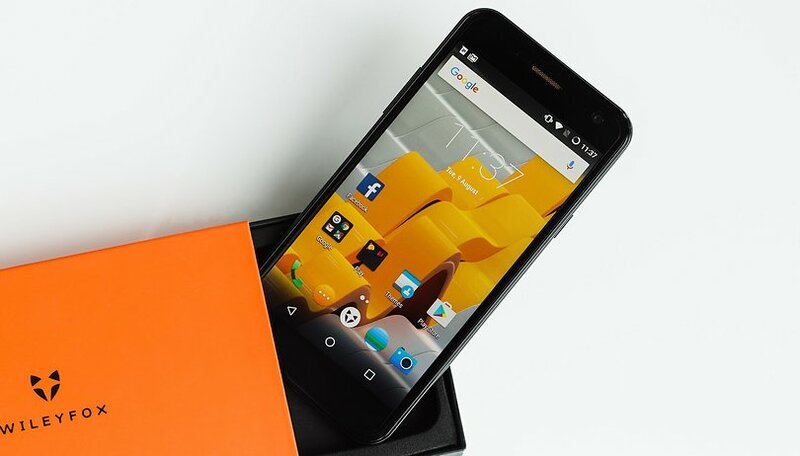 The Wileyfox Spark comes running Cyanogen OS 13, which is based on Android 6.0 Marshmallow. Whether the software can be OEM unlocked, like on the Wileyfox Swift, and replaced by third-party firmware, is not yet clear. There are currently neither official images for CyanogenMod nor even Cyanogen OS. Cyanogen OS is, in the budget smartphone sector, the best thing you can hope for. The US-based software provider Cyanogen Inc. supplies its software to numerous smartphone manufacturers in the budget range. This ensures frequent software and security updates, solving another common problem with low-range devices. The Wileyfox Spark is terribly slow. And it makes no bones about the fact that it is an entry-level smartphone. Its hardware delivers as much as it promises, i.e., not much. For WhatsApp and Facebook the performance sufficient. But if the latter features a 360 photo, it will certainly not appear on the Wileyfox Spark’s screen. The MediaTek 6735 quad-core 1.3 GHz has enough power to outperform some smartwatches but not much more. The seemingly eternal loading times are the fault of the slow internal memory. It ensures that every misplaced tap of the screen is cause for bitter regret. Then there is the scarce internal memory, which was all but filled following a few pictures and the installation of the benchmark apps used for this review. The internal memory is, as previously mentioned, expandable via MicroSD. The manufacturer says 32 GB is the maximum size. But I had no trouble using a 64 GB microSDHC card and formatting it as internal memory. During our testing period, by using the Lexar Professional 1800x microSDXC 64 GB card, we even achieved a boost in performance. I have not had the displeasure of hearing a speaker as bad as that found inside the Wileyfox Spark since the Nexus 4. The volume is much too low, on the wrong side (the rear) and it sounds like 90 percent of the audible frequencies have been removed. The Wileyfox Spark’s camera sensors are sluggish and imprecise; at least the blurred and faded outlines and colors that pass for photos give that impression. For just a few dollars more, you get a much better smartphone camera with the Moto G (2015). If the camera performance is a purchase criterion for you, you should invest that extra money without a second thought. The 2,200-mAh battery found in the Wileyfox Spark is enough for continuous use. However, since the phone is so slow, it is likely only bought by occasional users, who should make it through a day without needing to charge the device. If not, they can buy extra batteries for £14.99 to swap in and out on the go. The Wileyfox Spark takes some interesting approaches, but it cannot keep up with the competition, even that from last year. In particular, the aforementioned Moto G (2015), which has now dropped to a similar price as the Wileyfox Spark, is superior in almost every way. This is a shame, because Wileyfox is fully capable of producing useful smartphones. The Swift was more developed in key areas, but it costs about £30 ($40) more than the Spark, precisely because it is much better. If Wileyfox aims to establish itself as an exciting Cyanogen-powered alternative, it would be wise to dispense with bottom-of-the-barrel offerings such as this. But it has a removable battery!!! This makes it instantly 1000x better than the Galaxy S7!! !